Kurukshetra is a web framework that’s developed with the aim of being the first open source framework which provides a solid foundation to host reasonably complex secure coding challenges while still providing the ability to efficiently and dynamically execute each challenge on the basis of user input in a secure sandboxed environment. 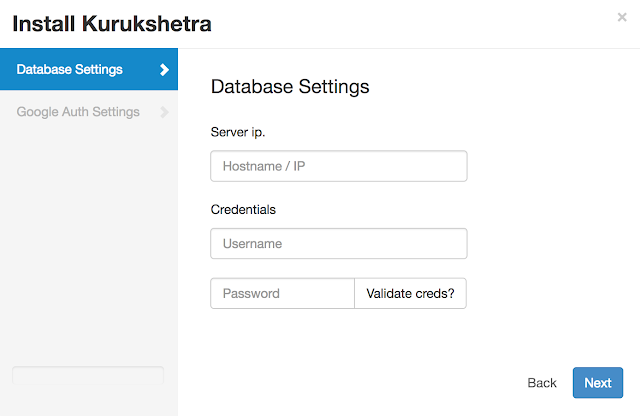 Kurukshetra is composed of two components, the backend framework written in PHP, which manages and leverages the underlying docker system to provide the secure sandbox for the challenge execution, and the frontend, which is a user facing web app providing all the necessary controls, for the admin to host and modify the challenges , and the user to execute and view the result of each of his input. Kurukshetra has been tested both on Ubuntu/Debian (apt-get based distros) and as well as Mac OS. It should ideally work with any linux based distributions with PHP 7.2, MySQL and Docker (along with remote API enabled) installed. Give challenges/uploads directory write permissions for www-data user (see uploads/README.md). Visit http://localhost or http://127.0.0.1 to navigate into installation (will auto redirect into /installation/). Enter the MySQL DB credentials (user should have the permission to create database) and click on validate to see if the credentials are correct. Build kurukshetra image from the Dockerfile: docker build -t kurukshetra . Alternatively, you can just run python install.py from within the directory installation/optional which will go ahead and install Docker (if not installed already) and will configure the Kurukshetra docker image automatically. The following are couple of ideas which we have in mind to do going ahead with Kurukshetra. If you have any ideas/feature requests which is not listed below, feel free to raise an issue in github. Support for more languages including but not limited to JAVA, NodeJs and Ruby on Rails. Write more challenges along with unittests to cover all the OWASP Top 10 vulnerabilities. Gamification of the whole framework by introducing scorebard based on challenge solving points (predefined points are already available for challenges based on difficulties).